27 Brookdene, Shankill, Dublin 18. 21 Ardbrugh Road, Dalkey, Co. Dublin. Station House, Sorrento Drive, Dalkey, Co. Dublin. 23 Wyattville Close, Loughlinstown, Co. Dublin. 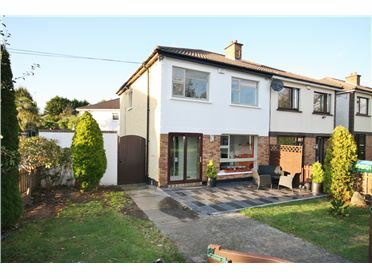 4 Bed Semi-Detached House - 115.9 m² / 1248 ft² Wyattville Close is a mature and convenient location within walking distance of the DART, LUAS and Tesco Shopping Centre in Ballybrack as well as being within minutes of the M50 and N11 by car. Number 23 is a semi-detached 4 bedroom home in its original format with a long westerly facing rear garden and garage that gives enormous scope to extend / remodel for the needs of today's growing families. Dalkey Sound,Green Road, Dalkey, Co. Dublin. 5 Bed Detached House - 4000 ft² / 371.61 m² North House is a special detached family home that extends to over 370 sq metres including three south facing balconies with sea views. An excellent location tucked off Dalkey's Coliemore Road is complemented with an unusually high specification, design and finish. This is an attractive and comfortable home. A B3 Energy Rating make this home an attractive proposition for the savvy buyer who wishes to be warm all year round and not have to worry about the cost. 17 Wynberg Park, Blackrock, Co. Dublin. 4 Bed Semi-Detached House - 123.19 m² / 1326 ft² Number 17 is a fastidiously maintained four bedroom semi-detached home in its original format that gives enormous scope to extend / remodel for the needs of today's growing families. Wynberg Park Blackrock is a mature and quiet tree lined residental cul de sac off Stradbrook Road Blackrock. 4 Bed Detached House - 130 m² / 1399 ft² Burnaby Mill is a desirable upmarket location for growing families within minutes walk of all that Greystones has to offer. Number 26, a four bedroom detached house has the added advantage that it is tucked away beside an attractive and well maintained large green area – a paradise for any child to have on their doorstep. This spacious property has a South facing private rear garden and the longest driveway in Burnaby Mill for off-street parking .